If you’re living in Toronto or Westmount in Quebec, you’ve likely already passed the dockless bright orange bikes popping up on city streets. The bikes belong to Dropbike, a Toronto-based startup that has undertaken seven pilot projects for its “smart bikes” in Ontario and Quebec cities since June. So far, the bikes have found a home in four college and university campuses around Toronto — including Ryerson University and the University of Toronto — and the company launched its newest pilots at Humber College’s North and Lakeshore campuses on Thursday. Dropbike is also running pilot programs in Kingston and Queen’s University. Bikes are located at “havens” — small rectangles that typically hold three or four bikes — and to access a bike, users must download the app and use it to scan the bike’s QR code. It costs $1 per hour to rent a bike, and users are charged a $49 deposit. To get around using docks, Dropbike equipped the bikes with internet and bluetooth connections, and put a lock on the back wheel that activates when the bike isn’t in use, to prevent thieves from hopping on and riding away. “We’ve taken all the technology on the dock and put it on the bike and the smartphone app,” Meacher said. 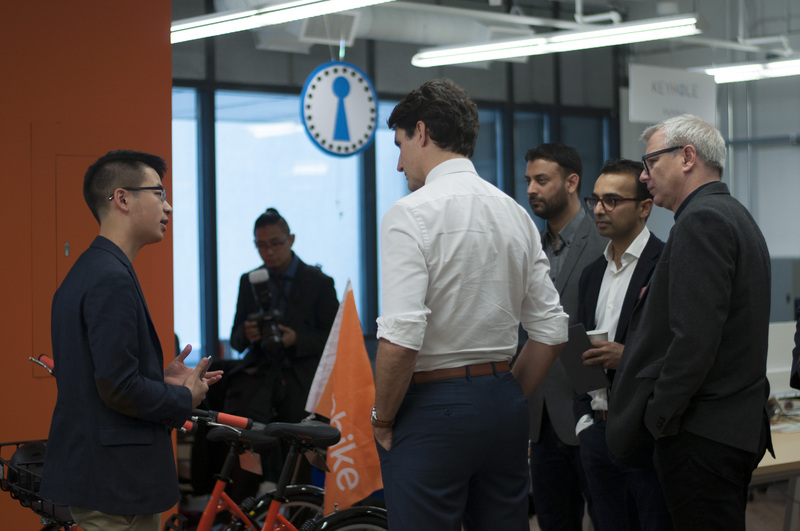 Dropbike with Prime Minister Justin Trudeau during his visit to OneEleven. In both Toronto and Montreal, bike sharing systems are owned and operated by the cities. Toronto Parking Authority will spend $1.7 million on the Bike Share Toronto in 2017; in 2016, it spent just under $1 million. The program was expanded last year with $4.9 million in funding from Metrolinx, and in August, the system used $4 million from the federal government and the city to bring the total number of bikes to 2,750, and the number of stations to 270. Montreal’s Bixi system, which covers 11 boroughs and two cities on the island, including Westmount, cost $9.01 million to run in 2016, including the bikes and docking infrastructure, advertising and “other charges.” The city’s contribution to Bixi’s $9.6-million revenue was $2.9 million. He admitted “the back-end economics are extremely fluid” currently, and will depend on how many cities the company operates in and the number of bikes on the street. The company said it has around 300 havens and more than 500 bikes across all three cities. More than 2,200 users have taken 10,000 rides. Both Toronto and Montreal have strong cycling cultures, bolstered in part by their bike-share programs. But Meacher said Dropbike doesn’t see itself as a competitor to Bixi or Bike Share Toronto, and could instead be a complementary service. He suggested that Dropbike could better serve suburban areas, and riders who might not want to commit to riding a bike “every single day forever,” like seasonal cyclists, tourists, and students who might find the price point more affordable. Kelsey Rolfe is a freelance journalist based in Montreal. Ask an Investor: When should I hire a VP of finance?